The history of Cape Verde is full of pirate invasions. 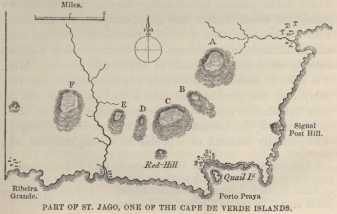 When the first Portuguese arrived in 1456, the islands of Cape Verde were uninhabited and completely covered with vegetation. Due to the presence of humans and the degradation of pastures, the environment deteriorated slowly over the years and the remoteness of the continent’s archipelago, as well as its proximity to South America, led the country to develop completely differently the rest of Africa. In 1462, the Portuguese founded the city of Ribeira Grande on the island of Santiago (now Cidade Velha). To build the native slaves were used on the west coast of Africa and Cape Verde became an easy starting point for ships that shifted slaves between America and Europe. Sir Francis Drake, an English privateer, sacked the town in 1586. Until 1747 the islands remained under Portuguese rule and thrived until the first of several droughts brought to their knees. Overexploitation of herds and fierce deforestation did nothing but make things worse by preventing low residual moisture from the soil to fertilize the fields. Three severe famine sealed for two centuries and resulted in the deaths of more than 100,000 people. The Portuguese continent never sent its aid during this unfavorable period. The local economy is mainly based on the slave trade, suffered a sharp decline in the late nineteenth century, leading the country to shift to a different and more modern economic activity based on agriculture and fisheries. In 1832, a well-known scientist named Charles Darwin landed on the islands of Cape Verde and conducted some studies on his evolutionary theories, using as reference, certain types of plants and animals found only in Reals. To go deeper, visit his story on the website Darwin Online. Throughout the year 1800, many Cape Verdeans emigrated to the United States, attracted by the American dream and the practice of some American whalers in recruiting sailors from the islands of Fogo and Brava. At the end of the year 1800 the islands became an important point in the Atlantic for the supply of coal, water and animals, called for an increasing expansion of maritime transport. However, during the first half of the year 1900 the drought continued and Portugal remained indifferent: thousands of people died of hunger. Although the Cape Verdeans were mistreated by their rulers, because of their lighter skin, some of them received a statement (unlike other Portuguese colonies in Africa) and the first schoolboy was established. At the time of declaration of independence, about 30% of the population were literate, compared to 5% of other Portuguese colonies. Beginning in 1960, Guinea-Bissau had begun the longest liberation war in Africa that the Cape Verdeans also took part against the Portuguese dictator Salazar. Cape Verde in 1975 was independent, although never having lived a day of war in its islands. The drought continued to persist, despite a more benevolent climate and the duplication of plantations in the year 1980. This led the country to seek international aid for food supplies. Finally, in 1991, there were the first multiparty elections and the MPD (Movement for Democracy) party won with 70% of the votes, under the leadership of Carlos Veiga as prime minister and Antonio Monteiro, president of the Republic. Both were re-elected the following year with the new Constitution. In the early 1990s there were some divisions within the party (because of slow economic growth due to drought), until 1995, when MPD firing in the country. In 1997 it destroyed about 80 percent of wheat crops because of a new drought. A new president and a new prime minister were elected in 2001, returning to power the African Party for the Independence of Cape Verde (PAICV, leftist party). In 2002, for the first time, the government asked the United Nations for food issues due to the drought now. 160,000 people were saved from hunger by the world food program in 2003. Some countries such as Portugal, France and the Netherlands and the World Bank and ECOWAS have contributed heavily to finance some policy projects of the new Prime Minister Neves. Strong investment in tourism, with the construction of the necessary infrastructure (eg international airports, ports and highways), expansion of construction plans and agricultural land, as well as a readjusted economic policy in fisheries and tourism are bringing growth and well -estate in Cape Verde, which was recently discovered by tour operators around the world and reinforced by substantial private investments. The future of the country is in the hands of young Cape Verdeans and good politics: if the former will not be influenced too much by globalization, the latter will be able to mediate between development and sustainability, Cape Verde is destined to become one of the most desired destinations of the world. Antonio da Noli descobre o arquipélago. Na época, estava ao serviço do império português e as ilhas estavam completamente desabitadas. Na ilha de Santiago vem a primeira cidade, Ribeira Grande, hoje Cidade Velha. Cristóvão Colombo, durante sua terceira viagem oceânica, visita Boa Vista. Primeira grande fome e seca no arquipélago. Naquela época, o governo português não enviou qualquer tipo de ajuda. O comércio de escravos começou a declinar e muitos cabo-verdianos foram recrutados por baleeiros americanos. Uma parte da população cabo-verdiana mudou-se para Boston, uma pequena parte emigrou para outros estados da América Latina e Europa, incluindo Itália, França, Holanda e Bélgica. Estima-se atualmente que a população de Cabo Verde no exterior é 3 vezes maior daquela residente no país. O cientista Charles Darwin chega em Cabo Verde e elabora algumas de suas teorias sobre a evolução, estudando algumas plantas e animais do lugar. Com a declaração de independência de Portugal, Cabo Verde se torna uma das poucas nações a ter obtido isso sem um dia de guerra em suas terras. O primeiro presidente eleito com eleições livres é Antonio Mascarenhas Monteiro. A redação da nova Constituição prevê um sistema multipartidário. O MPD, Movimento pela Democracia, nasceu. O PAICV ganha as novas eleições após 20 anos de governo de centro-direita. Abre o aeroporto internacional da Boa Vista, com o qual o turismo começa, um recurso que acelera muito o desenvolvimento da ilha. Jorge Carlos Fonseca (MPD) se torna Presidente da República, embora o governo ainda seja centro-esquerda. Ulisses Correia e Silva ganhou com as novas eleições MPD, substituindo 16 anos do governo PAICV, enquanto Carlos Fonseca foi re-eleito para a Presidência da República.